The post money value of a company refers to the total value of its equity, and not the individual share price. Although the equity value will be impacted by putting additional cash on the balance sheetBalance SheetThe balance sheet is one of the three fundamental financial statements. These statements are key to both financial modeling and accounting. The balance sheet displays the company’s total assets, and how these assets are financed, through either debt or equity. Assets = Liabilities + Equity, the individual share price will be unaffected. The example below shows how that’s the case. 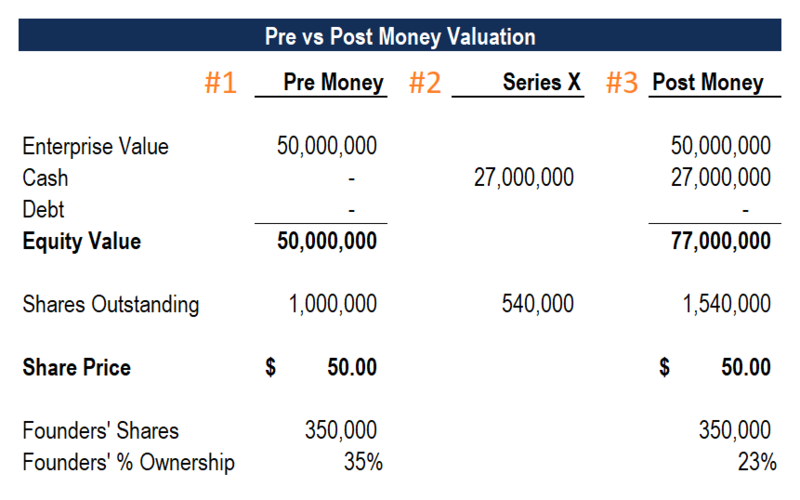 Below is a three-part example of how to calculate the post money valuation of a company undergoing a Series X funding round. The company below has a pre money equity valuation of $50 million. Before the round of financing, the company has one million shares outstanding, and thus a share price of $50.00. The company will raise $27 million of new equity at the pre money valuation of $50 million, which results in it issuing 540,000 new shares. The company will add the $27 million of cash (assuming no transaction costs) to its pre money value of $50 million to arrive at a post money valuation of $77 million. Post-transaction, the company will have 1.54 million shares outstanding, and therefore, its share price remains $50.00. The enterprise value of a business is the value of the entire company without considering its capital structureCapital StructureCapital Structure refers to the amount of debt and/or equity employed by a firm to fund its operations and finance its assets. The structure is typically expressed as a debt-to-equity or debt-to-capital ratio. Debt and equity capital are used to fund a business’ operations, capital expenditures, acquisitions,. A company’s enterprise value is not affected by a round of financing. While the company’s post money equity value increases by the value of cash received, the enterprise value remains constant. When undergoing a round of financing, the original shareholders (pre-transaction) will have their proportional ownership diluted as a result of issuing new shares. Per the example above, the founders had 350,000 shares before the Series X financing, which represented 35% of the total shareholding. Post-transaction, they will still have 350,000 shares, but it will only represent 23% of the total. The value of their stake remains the same (350,000 x $50 = $17.5 million). 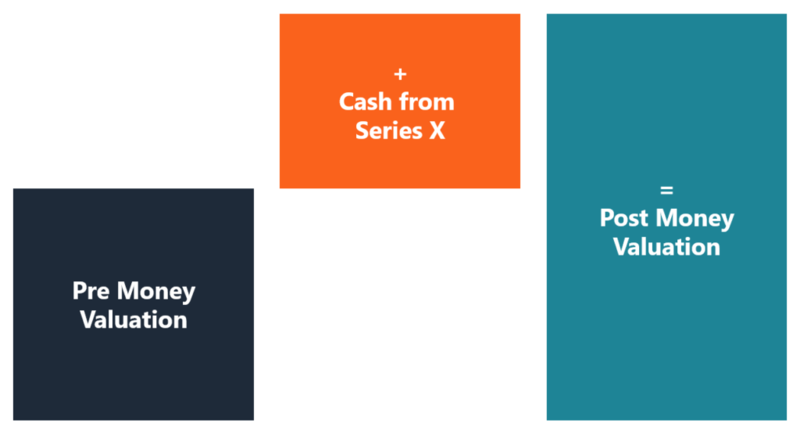 Companies that are undergoing a financing round (i.e., Series X) will need to negotiate with potential investors about what the company is worth. Because there is incremental value in the share features above, the VC firms’ preferred shares are more valuable than common shares. In essence, the VC firm gets to purchase preferred shares at a common share price, improving its investment return profile.